Ed Isenberg created this background using XFrog’s Prehistoric Plants collection. 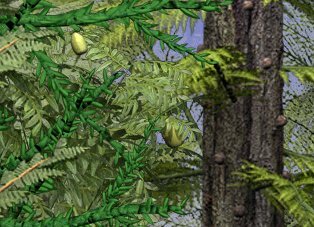 The wonderful foliage used for the background on the Dinosaur Island site was created by Ed Isenberg using XFrog’s prehistoric plant library (click here to go to the XfrogPlants site). This is a good example of the environment that we will create for Dinosaur Island. We know that these plants are historically accurate for various time periods. However, we aren’t paleobotanists, so if any of you visitors to the site are, please feel free to contact us because we certainly could use your advice.